In football, there’s no rest for the weary. Instead of dwelling on the past misfortunes, Virginia Tech is gearing up and preparing for another grueling, 60-minute game. Pitt is coming off a 23-13 victory over Virginia in a rain-soaked Scott Stadium. Panthers running back Darrin Hall recorded 19 carries for 229 yards and three touchdowns. Fuente is 2-0 against Pitt during his time at Virginia Tech, but those victories have been anything but convincing. In 2016, the Jerod Evans-led offense made the trip to Pittsburgh and torched Narduzzi’s press coverage, causing him multiple meltdowns on the sideline. Isaiah Ford, Bucky Hodges, and Cam Phillips all tallied 100+ receiving yards in the game. Meanwhile, James Conner (who’s now tearing it up at Heinz Field for the Steelers) racked up three touchdowns on the ground for Pitt. 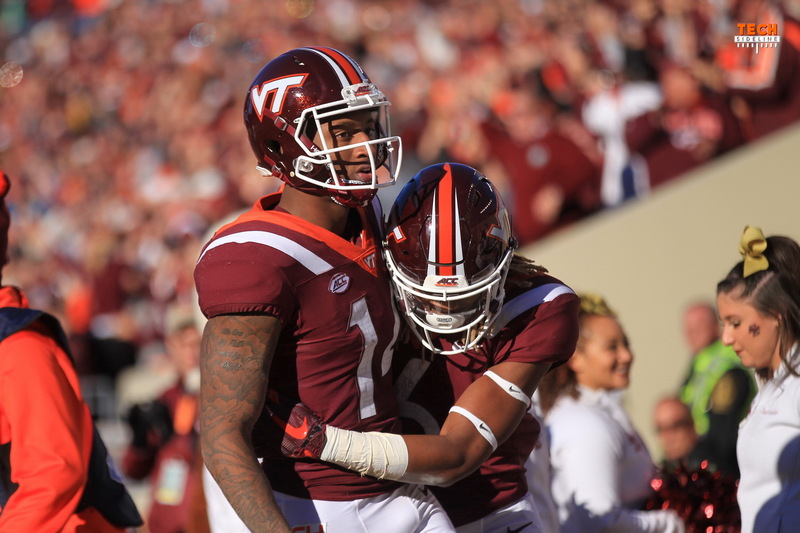 The Hokies were able to hold on for a 39-36 win. Last year, in an ugly offensive game, Virginia Tech triumphed 20-14. Cam Phillips caught the go-ahead touchdown pass with just over six minutes remaining. 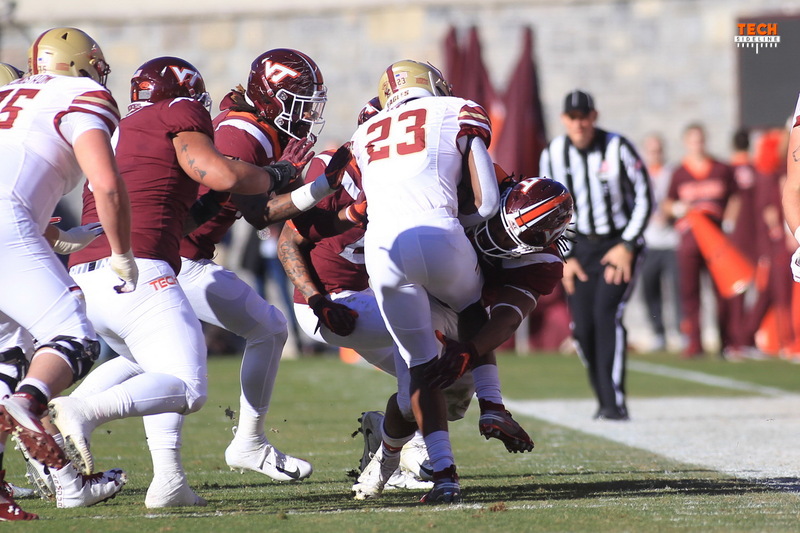 Reggie Floyd had his famous chase down tackle in the closing seconds, and the Hokies’ front stuffed the Panthers on four straight tries from the 1-yard line to preserve the victory. Fuente has noted that the execution hasn’t been where it’s needed to be this year, and that’s been the cause for some of the shortcomings. It’s been a season-long problem for the Hokies, one that even came up in Virginia Tech’s dominating 24-3 performance against Florida State. 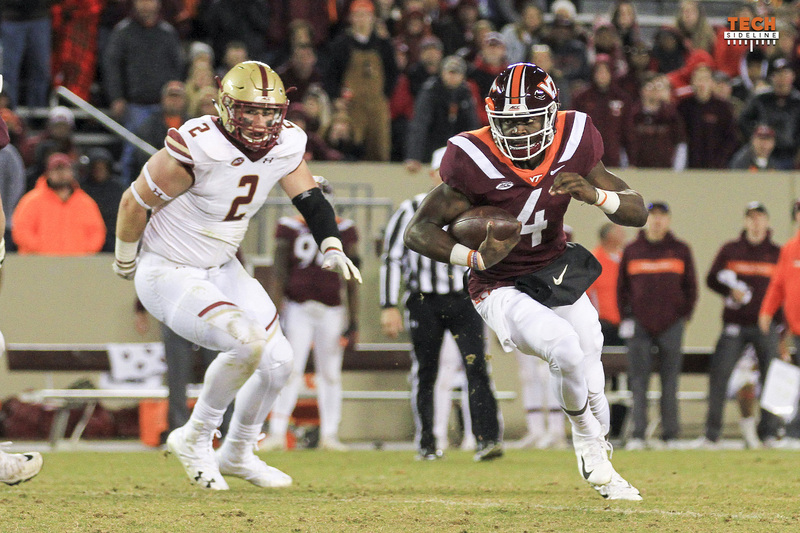 When Rayshard Ashby and Dylan Rivers were unable to play against Boston College, redshirt freshman Rico Kearney and true freshman Dax Hollifield stepped into their respective spots. Kearney (18 tackles) and Hollifield’s (10 tackles) play were major bright spots in the loss. After the game, Bud Foster said Hollifield is “that Sam Rogers kind of guy.” It’s a sentiment that Fuente would agree with. Rivers and Ashby’s health remain uncertain, but its optimistic to see the depth that the team has behind the usual starters. While Hollifield had largely shared reps with Rivers over the past few games, Saturday was the first true look at Kearney and he passed the eye-test. At the whip linebacker spot, Divine Deablo garnered a career-high 14 tackles at the position in place of Khalil Ladler, who was ineligible to play the first half last Saturday because of a targeting penalty. Tyree Rodgers moved to Deablo’s typical position at free safety. Ladler only played on special teams in the second half, instead of moving back into the starting defensive lineup. It wasn’t an indictment on Ladler, but more so a decision based upon how well Deablo and Rodgers were playing in the midst of the game. Quarterback Ryan Willis was banged up after a run down the sideline, and Quincy Patterson relieved him for seven snaps in the fourth quarter. Patterson had last played for three snaps against North Carolina. On Saturday, the offense picked up two first downs during Patterson’s brief stay. The signal caller carried it two times for 10 yards, including a three-yard rush on third-and-1. Patterson’s only pass fell to the ground incomplete. It’s clear that Fuente is going to redshirt Patterson by keeping him at the four-game threshold, but could he see an expanded role down the stretch? Willis was hampered down the stretch, and he was unavailable for post-game interviews following the Boston College game because he was being attended to by trainers. However, there’s no reason to worry that he’ll be anything but ready to go this Saturday. “He’s fine. He went through practice yesterday,” Fuente said. Bryce Watts on the other hand will not available against Pitt. The sophomore fractured his forearm in the first quarter, but Fuente refuses to rule him out for the season yet. If I was coaching offense this week, I would be working on fades with our big WRs. I say do what they did two years ago to Pitt. Pitt is gonna run the same scheme this year too.